I have been a great fan of space combat simulators. 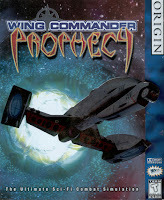 I have played many of them but my favourite has to be Wing Commander Prophecy. I do not know why that is as I adore elite, privateer or even Starlancer but Wing Commnader series and especially prophecy hold a special place in my space flying heart. Recently I started rewatching the first season of BattleStar galactica and some of the flying missions in the BSG reminded me of missions I had flown in Prophesy. I ended installing the old disks to my new gaming rig and blasting my head on the wall because all of the videos where coming out wrong. I Googled it and found out the audio on the videos is the problem and that I may overcome it with some directx configuration hacking. Needless to say I was in no mood to do that, i wanted to play the game right away. Ok I admit I got lazy, but as always is the case, someone on the interne was not. I googled it and found that there are ready made patches by fans of the series that wanted to play the game on their their new gaming rigs as well. I downloaded the patches and, not only the videos where corrected, but the graphics resolution could be changed to anything beyond the standard 640x480 of the time the game was released. So for anyone looking for it you can get all the patches from here. A big thanks to the WCP community for creating those.